I’ve wanted to feature an African American cartoonist or a graphic novelist here for awhile now. 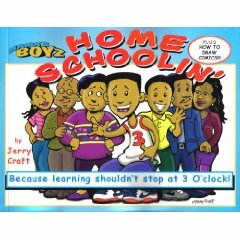 Mama’s Boyz: Home Schoolin’ and Mama’s Boyz: As American as Sweet Potato Pie!, by author and illustrator Jerry Craft, are funny, informing, and inspirational. Don: How did you come to be an artist/cartoonist? Jerry: Ever since I was old enough to hold a pencil (without trying to eat it) I’ve always loved to draw. A few months ago I found a book that had some of my old homework in it, and I had drawn superheroes all up and down the margins. Although I was always an “A” / “B+” student, it was obvious that this was my passion. Unfortunately when I was a kid people didn’t use the word “artist” without putting the word “starving” in front of it. The thought of me being an artist for a living had my parents thinking that I’d be 50 years old still living at home and asking for my allowance each week. So although I had passed the tests to be accepted into Music and Art and the High School of Art and Design, they were not going to let that happen. They ended up sending me to Fieldston High School which was is a great school located in the exclusive Riverdale section of the Bronx. When it was time for college, I was old enough to make my own decision and chose the School of Visual Arts in NYC where I got my B.F.A. in advertising. My first job was as a copywriter where I got to write a lot of print ads and radio commercials. After about eight years I moved on to a larger firm. Unfortunately that was in the early 1990’s when the whole ad biz went in the toilet. Luckily, I was able to fall back on my cartooning skills. I worked with Barbara Slate for a few years drawing comics such as Sweet 16 for Marvel, New Kids on the Block for Harvey, and the graphic novel Yuppies From Hell. Don: So tell us a bit about the cartoons and the book. The book was a collection of my best comics and featured a foreword by one of my favorite cartoonists, Lynn Johnston who does “For Better or For Worse.” I received great press in several comic magazines, and even got a nice write up in “Great Books for African-American Children.” Which surprised me because I didn’t consider it a children’s book. Not that there was anything that wasn’t suitable for kids, but I did the book for people like me, mainly adults, who grew up reading comic strips. However, I didn’t choose my audience, my audience chose me. So after months of being asked “Can I get this for my eight year old?” I finally started to say yes. And I’m glad I did. Don: What is the target age range for the books? So when my 7 and 9 year olds read it (I don’t do anything that I can’t show to my kids), they got to see a lot of humor with Yusuf trying to change and feed the baby. But on the other hand, the teenagers who I taught at a NYC High School got a whole different message. One whose message was geared more towards them. As a result of this story, I was presented with a “Conversation Starters Award” by the DC Campaign to Prevent Teen Pregnancy. They also distributed 100 copies to their audience. That was a great honor for me. Don: Tell us about some of the other features in the books. Jerry: I made sure to put a lot of other cool features in the book such as comments about certain strips, a section on how I draw my characters and construct a comic strip, and even an old-fashioned flip book at the bottom. I get comments from parents all the time who are shock at how many times their kids are rereading the book. That’s the best compliment I could ever hope for. Over the years, I’ve also used my comic strip spread a lot of other important messages to our community. The first book has a huge section on diabetes. In fact, in the comic, Tyrell and Yusuf’s dad passed away from complications related to diabetes. For years, they acted as spokes characters for the American Diabetes Association’s African-American program. Most recently I used them for a campaign for the American Council for Fitness and Nutrition to combat childhood obesity in the Kansas City School system. Don: Besides the Mama’s Boyz books, what other projects do you have in the works? Jerry: Two years ago, I decided to stop working for corporate America and start Mama’s Boyz, Inc. In addition to doing my books and shirts etc… I have also had the pleasure of illustrating my first two traditional children’s books. 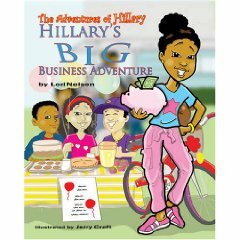 The first was “Hillary’s Big Business Adventure” (Nelson Publishing, LLC) written by Lori Nelson. This was a great experience for a few reasons. First, I loved that it was a story of a 10-year old African-American girl who wanted to buy a new bicycle, but wanted to use her OWN money! So Hillary, her baby brother, and their friends come up with a plan to raise the money themselves. I try to make sure that everything I do has some type of crucial thing to teach kids. And money management is a much-needed topic. The other great part was the satisfaction I got from helping someone realize their dream. Lori told me that she had always wanted to do this story but had had a very difficult time finding an artist. Yes, we can be flakey! 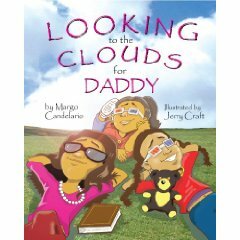 My newest book is called “Looking to the Clouds for Daddy” (Karen Hunter Media) and is the story of three sisters who lost their Dad when they were very young. It was written by my long-time friend Margo Candelario whose husband Phil died suddenly from a heart attack when he was only 32-years old. Margo wrote the story not only for her own three daughters, but also as a way to help comfort other children in similar situations. It’s our dream to put a copy of the book in the hands of every child who has lost a parent or loved one, so we can use as much help spreading the word as possible. I’d have to say that of all the things that I have done, this is one of the most special. I still remember when our families gathered to see the book for the first time. It was an amazing moment. And the response to the book, especially from children who identify with the three girls, has been equally amazing. Don: What’s on the horizon? Jerry: As far as my dreams, I have already begun to do the layout for my third book, “Mama’s Boyz: The Big Picture” which I hope to have by mid-summer. Jerry: Thanks for your time! I’m a big fan of comic strips. Just like with reading books, I never much paid attention to the lack of comics featuring African Americans until I was an adult. It’s good to see Mr. Craft’s work out there representing not simply for “Black” comics but for another angle on American life, period. It would be tough for a book to appeal to 7-18 year olds (Harry Potter to date is about the only one I can think of that does). But comics (and animated cartoons on TV) are two areas where the underlying message can be sophisticated because the illustrations help it cater to a wider audience. It’s what’s so great about them and why even now, I turn to them when I open a newspaper and still watch cartoons with or without my kids. ::smh:: Glad that inspired you. Pushing through until someone “gets it” feels like the primary job of African Americans in the cretive field. Good point — younger readers and older take different things from comic strips. It’s great to find more quick-read, illustrated books with sophisticated storylines available and enticing to male readers and reluctant readers who think reading a comic book is getting away with something. Well done, Mr. Craft. Really great interview. I’m glad that Jerry kept working at it and found an audience. Wonderful and inspiring story. I love people who can draw and tell stories. Great interview! Thanks, Don, for featuring Jerry. He’s a wonderful artist and supportive of others in the field. Keep soaring, Jerry. Congratulations on your books. Look forward to seeing more. Wonderful Interview, BRAVO! Jerry is the most talented illustrator I know. His artistry is cutting edge in the book “Looking to the Clouds for Daddy” I expect a Caldecott award for his visionary expertise. Thank you for sharing your talent with the world and I look forward to more adventure and life experiences with Mama’s Boyz. book as well as my third Mama’s Boyz book.